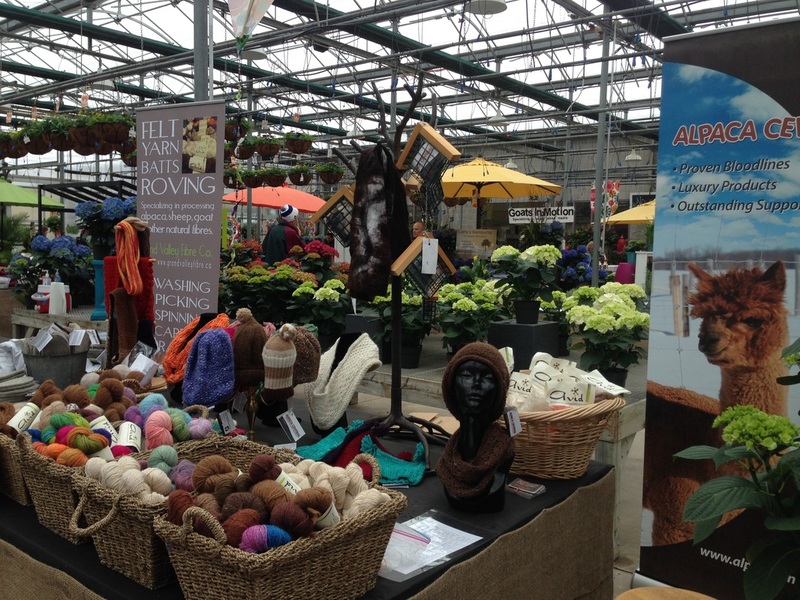 Awesome last day today at the Terra@Home Market in Milton, where we’ve spent the past 10 Saturdays in the greenhouse. What a great venue! Surrounded by beautiful plants and flowers under the cover of glass enjoying the sunlight, taking a break from this year’s relentless winter weather and meeting the most interesting people from Milton, Mississauga and Oakville as well as Edmonton, Saint Johns and Winnipeg. Sad to see the market end but it’s time for Terra Garden Centre to get ready for spring planting season. Our Avid yarn, spun at Grand Valley Fibre Company was very popular and made the local knitters drool as they fondled the many different blends. We sold out of the alpaca/merino/bamboo/cashmere blend the day we brought it. No wonder, it was buttery silky soft. We introduced the public to the Bear Buddy kits, dryer balls and our own insoles. There was definitely something for everyone and lots of repeat customers. We even inspired several people to try knitting and crocheting! The plan now is to get through this year’s shearing then hibernate for the summer while we restock inventory and develop new products, in preparation for the fall markets and 2014 Christmas season and launch our on-line store. 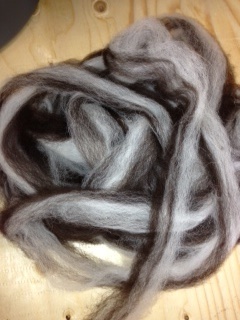 Yesterday we bastardized some beautiful black alpaca fibre by blending it with white alpaca laced with merino. At one stage during the process it looked almost skunk like and although nothing was said, I’m sure everyone was skeptical at the results of the combination. 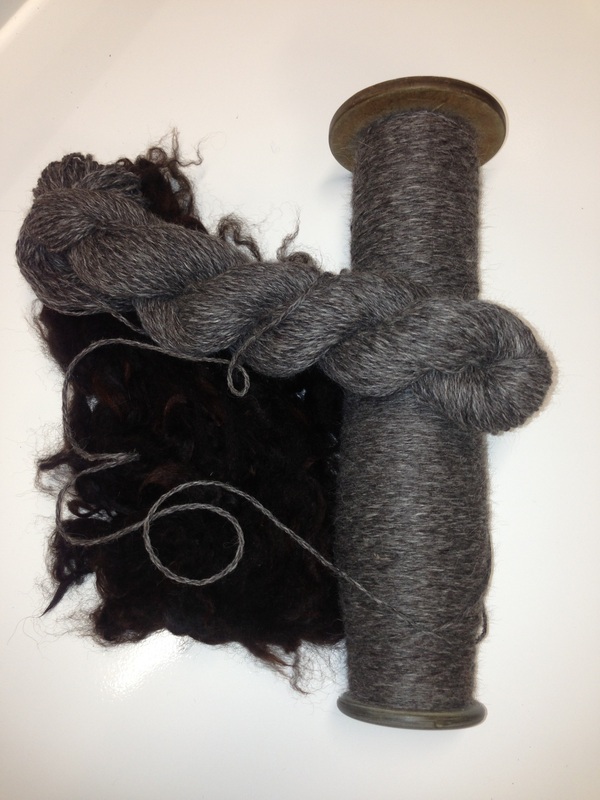 It has now been spun and plied, producing a gorgeous rich steel grey yarn. Can’t wait to see it knit into something special! So, having alpacas and the mill has now taken me into completely new territory. While I always thought I was a purist, I guess I’d never really given myself the chance to step outside the box into the unknown. When we first got alpacas, I took the stance that as the fibre comes in 22 recognized colours, why would anyone need to change the colour to something else, let alone blend it with another fibre. But now, my creative side is rising up and challenging my conventional side and creativity appears to be slowly taking over and becoming the norm. Two nights ago I stayed up well past the traditional bedtime (yes I’ve always been a night person) experimenting with some new dyes that I’d recently purchased. I had a blast and by the end of my dyeing adventure, my fingertips were blue tinged and the plain white alpaca sock yarn was now a rainbow of colour. Anyone who knows me well, knows that I’ve never been one to follow a traditional path when I make something and dyeing was no different. That night, I added colour to one skein at a time, truly playing with the effects of the colour and the dyes. Only the basic theory of the colour wheel was followed, nothing was measured and no recipe was used leaving the final outcome a sensational predicted surprise. February 2013 and the next chapter of our adventure has begun. The anxiously anticipated mill equipment was delivered and installed. The formal training has been completed and now the practice to perfection continues. Again, we are extremely grateful and fortunate for the network of support and expertise we have around us. Our plan is to process all the alpaca fleece we currently have stockpiled over the past 2 years, as well as some samples of sheep and goat fleeces, as we learn the nuances of the equipment, the fibre, the environment and the process before officially opening the doors to the public.Admittedly there is a lot to learn, but we’re confident that we have a solid foundation to build on and the drive and commitment to get it done. Much thought and consideration was put into the planning of the mill structure and layout and we’re confident that not much was overlooked (except for the mirror). Our combined backgrounds and years of experience in manufacturing and processing guided us to the placement of the machines and will result in efficiencies and clear lines of site in the process which will be beneficial as the business grows. We are pleased with our decision to choose McDermott equipment and Aldo is already calculating and tracking the throughput of the different machines. Nothing like production targets (and stop watches) to get the motors humming! Be proud Chuck! I must admit that I’m surprised at our collective ability to admit defeat and walk away when frustrated, knowing that coming back the next day will bring more positive results. After less than a week, we’ve already produced some beautiful yarns including 100% shetland sheep 3ply, 100% alpaca 3ply in different weights, alpaca/nylon sock yarn and a blend of alpaca, mohair & merino. There is a healthy supply of roving waiting patiently (can roving be patient?) 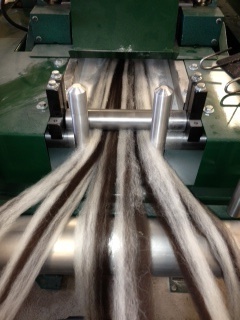 to be spun into more beautiful yarns and plain white yarn waiting to have vibrant colour splashed over it. 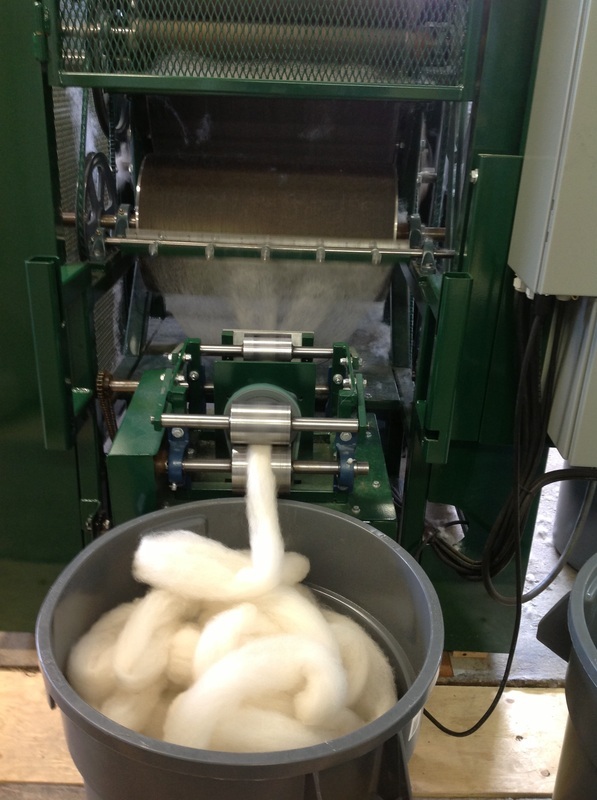 Soon the doors of Grand Valley Fibre Company will open and the fibre producers will have the choice of another custom mill in Ontario and we’ll look fondly back to these early days and smile at our connection to Lucy and Ethel in the chocolate factory! The close of 2012 brings with it the end of year 4 of our 5 year plan and the opening of yet another new chapter in our rural adventure. After many months of planning and preparation, we’re excited about our decision to start a natural fibre processing mill on the farm. We are now anxiously awaiting the delivery of the equipment. Needless to say, it has been a busy year. Our farm store, Gallery 109 opened for business in February and along with our own luxury alpaca products, also showcases a variety of unique one of a kind pieces from local artisans. Aldo’s shearing business continues to grow each year as the local alpaca herds grow; shearing 200 alpacas this year! Never content to sit still, major barn renovations overtook the remainder of the year, in anticipation of the Grand Valley Fibre Company Inc. We effectively transformed the ‘boys’ barn into a functional processing facility and relocated the boys into what is now a ‘co-ed’ barn, following our first ever group gelding event. Sorry boys! Besides our participation at Ag Education Days for both Grand Valley and Milton, we joined the Dufferin County Town and Country Farm Tour Committee in an effort to become more engaged within our local farming community. Our kids continue to support our ventuure anyway they can and Risa is invaluable as ‘herd master’ during breaks from her studies. She does a wonderful job of managing the breeding and genetics of the herd and is now an expert in neonatal care. I continue to pursue informal learning in all things fibre, still working on my knitting skills, dabbling in spinning, weaving and rug hooking. I have yet to master my circular sock machine although in theory I know what I’m supposed to do. Along the way, I’ve been blessed to have met some fabulous people with an amazing amount of talent. Our farming skills got a boost with the purchase of a tractor for me and some additional farm implements for more efficiency and inspite of the lack of rain, squash, pumpkin and egg sales boomed. We welcomed many friends, both old and new, on the farm, some for the first time and others back to check out our latest projects. Its always fun to stop and have visit so if you are in the area or just looking for a day out in the country, please stop by. As always, we wish everyone a very healthy, prosperous and safe new year!